If your Frigidaire refrigerator is displaying an error code, we can help. New style Frigidaire refrigerators have built in diagnostic systems. If your refrigerator finds, sees, or detects a fault or error in the system, it will show an error or fault code. The error code will display where the usual numbers are on the display screen. When an error code is displayed, your Frigidaire refrigerator is telling you a specific fault. If the error or fault is not fixable by you, it will require a repair technician. There are many different model numbers of Frigidaire refrigerators (side-by-side and french doors) with digital displays so when you see an error code write down what is flashing or displaying. Don’t pull the power from the fridge if it shows an error code. If you pull the power plug it will erase the fault code. The display shows “Sb” or “5b” while in Sabbath mode. The Sabbath Mode is a feature that disables portions of the fridge and its controls in accordance with observance of the Sabbath and religious holidays within the Orthodox Jewish community. Sabbath Mode is turned ON and OFF by pressing and holding “∨” on freezer temp and “∧” on refrigerator temp for five seconds. In the Sabbath Mode, the High Temp alarm is active for health reasons. If a high temperature alarm is activated during this time, due to a door left ajar, the alarm will sound for about 10 minutes. The alarm will then silence on its own and a red high temperature icon will display. The high temp icon will continue to display, even if the door is closed, until the Sabbath mode is exited and the icon reset. The refrigerator will function normally once the door is closed, without any violation of the Sabbath/Holidays. When troubleshooting error codes, unplug the refrigerator and use caution. Do you have an error code on your Frigidaire Refrigerator that is not listed here? Please leave a comment below and we will assist you in troubleshooting the issue. d1 and SP showed up on my display of my Frigidaire gallery. It beeped for awhile then it stopped and the display went back to normal. What’s wrong? Sb mode on. I cannot get the display to go off. I even unplugged for 5 seconds. Cannot see arrows on Frigidaire to touch up or down. Suggestions. Light is off in fridge and freezer. Temps still cold. Help or suggestion. Thank you. I even read manual and tried few things. My son turned fridge of to clean it and then turned it back on. It is now getting warm. The error codes for the freezer is 0..for the refrigertor it says F. What does this mean? I have a Frigidaire side by side refrigerator that is flashing H1 and keeps beeping every 5 or 10 minutes, the freezer is also forming Frost on the inside. I try to reset the temperature and after 5 minutes it goes back to H1 and beeps again. I have also heard a clicking sound when sometimes. What part would I need to fix this? It’s about 4- 5 years old. Model # JSI-26. Hello I hope you can help mines doesn’t give me any code only numbers & my filter says good just on red where it say hi temperature we have tried to fix it but it jumps back to the same numbers and it isn’t cooling the top anymore. My freezer is not functioning and shows only the right side and crossbar of an upper case H (no vertical line on the left side). Model glfh21f8hbd. My refrigerator started making an alarm and gave the codes D1 5P when getting ice. I removed the ice bucket and got the same result. I have a 5 yr old fridge. Getting 5y CF code. It shut the fridge and freezer down, is that right? I read it’s a communications issue and that it’s the white wire in the 3 wire harness. No way to bypass this? I don’t need communication! The day the refrigerator was delivered SY EF code appeared. I didn’t google it and there was no mention of the code in manual. The freezer worked fine, but the refrigerator only cooled to about 60 degrees. Tech came out and said that the fan motor and main board had to be replaced. This was done, but SY EF came back on. Finally their senior tech came out and talked with a Frigidaire tech over the phone and diagnosed that there was a short in the electric wiring harness that could not be repaired locally. The process took a month but we now have a new operating refrigerator. Very frustrating. My Frigidaire fridge shows error code OF and OF. The fridge is at a cottage and everything was shut down for the winter. No power or heat. When power was switched on fridge did a single beep and that was all. No lights on in the fridge either. Control panel does not react to any attempts to activate any of display functions of the panel. Fridge is just short of 2 years old. Took the display panel out of the door and brought it to a appliance repair shop. They said panel showed fault codes DF and OP. PLEASE HELP! The code on my Frigidaire standing freezer is CE without SY with. Just ce. I have a Frigidaire Fridge model # FGHG2366PF. The control panel on the door displays ‘OF’ and ‘OF’ where the temps of the freezer and fridge should be displayed. None of the functions on the control panel work. No lights inside the fridge come on. The fridge is at a cottage and all power was shut off from December to March. The fridge is about 1 1/2 years old. I pulled the control panel from the door and brought it to an appliance repair location. They said it showed faults ‘DF’ and ‘OP’. Can this panel be reset? Any suggestions for repair? I get an H1, not HI, that flashes. Not sure what that could mean. I get it on the refrigerator side. I have error code E9 on a Frigidaire beverage cooler. My frigidaire model FGHF2366PF5A is doing the same thing. Push on cubed ice and get an error message 1C – and ice cubes will not come out. I have a “SY EF” error code on my Frigidaire Side by Side refrigerator. This is the 2nd time in a few months, and although we have fixed the problem for now, the unit behind the panel keeps icing over. The fridge is about 8 yrs old, and I am trying to figure out if it is worth fixing, or should I just buy a new one. I have a Frigidare Gallery. The control panel displays a fault code of 5Y EF. What can I do to correct this. Thx. We took the ice maker out and the panel. There was also ice the motor was hitting. We are also thinking the refrigerator needs from or the new chemical like freon. My code is OFF OFF. Panel is not accepting touch commands. If i throw the breaker and try stopping alarm, no response to silent alarm. Keypad seems defective. No lights in freezer or fridge. I have the same issue. I pulled the control panel display and took it to an appliance store. They said it showed ERROR CODE ‘DF’ and ‘OP’. Were you able to determine what caused your problem? Also what was the cause? Thanks Joey. I have a Frigidaire model fphb2899pf showing an error code 5Y CE. Can anyone tell me the meaning of this code? Frigidaire Refrigerator Error code D1 popped up on my fridge display, not in manual, can you help? Frigidaire FFSS2314QPAA showing “H” in the refrigerator section. I have a Frigidaire side by side model #JSI-26. The alarm thet goes off when you leave the door open keeps going off even though the door is closed. Then, when you open the door, the freezer side temperature have is flashing “H”. The freezer side is perfectly frozen and working fine. The fridge side however is cool but not cold. I’ve reset the alarm, the temperature setting, and even unplugged the entire unit for a few minutes but it keeps doing this. What could be wrong? I have a Frigidaire refrigerator FGRU19F6QFA. It was beeping and displaying a code 7. Did you recently have a power outage? Can you recheck the error code? We do not see anything in the database for Frigidaire refrigerator error code 7 and beeping. We got EF error code on our electrolux fridge and replace both control board AND the evaporator fan and still getting the error code. Any suggestions? First symptom was it stopped cooling. No code at that time. Unplugged for a few days and plugged back in, to our surprise, it worked for about 4 days and then would not cool and got EF code at that time. My Frigidaire side by side refrigerator is displaying H1 in the freezer setting window. Frigidaire refrigerator Error code H1 means the refrigerator thinks that the freezer and refrigerator temperatures are too warm. Unplug the refrigerator for 5 minutes. Plug it back in and it should clear the H1 error code. If not, increase the temp of both the freezer and fridge section and the H1 code will clear. I have a Frigidaire model FFHS2611LBB it is doing the same thing as above (shows H1 in the temperature window). We have unplugged it and raised the temperature. That works for a short time and then it happens again. Sometimes it happens several times a day, other times it will go 2 or 3 days and not happen at all. Ken did you find out what’s wrong? Mine is doing the same thing. I have a Frigidaire Gallery with bottom freezer, model LGUB2642LF3 showing an error code 5Y EF. Where do I find the evaporator fan and circuit so that I can check and or replace? FYI: Its error code SY EF and not 5Y EF. Error Code SY EF is the Evaporator Fan Fault. This usually means there is NOT enough airflow over the sensor, this can mean a faulty sensor, or evaporator fan motor. Access the evaporator assembly cover in the rear of the freezer section. In convertible units that can function either as refrigerators or freezers, and is located toward the bottom of the unit on the inner back wall if necessary, remove the two lower glass shelves and the crisper compartments. The Frigidaire Gallery with error code SY EF guide is here. It is for a side by side but will show you where the fan and circuit board are located. We had the SY CF error on our frigidaire gallery fridge. We changed out the control board and still not working. What could still be the problem? The freezer has no problem but the refrigerator is not cooling, it has error E8. What is the problem and what should I do? Is it safe to leave the refrigerator plugged in if you have the error code SY CE displayed? I dont want it to cause a fire to start and we dont knkw much about refrigerators. If we order thr control board, where is it on the fridge to replace it? I have a Frigidaire professional refrigerator FRSB19B3MLT that is displaying E6 error code on the freezer side. What does that mean? Please recheck the model number of your Frigidaire professional refrigerator as FRSB19B3MLT does not come up in the Frigidaire professional refrigerator database. In the meantime, even though the error code E6 shows, is the freezer and fridge section working properly? I have error code CS YF, i have replaced the control panel to only plug in and recieve the same error code. What now? The only thing that illuminates and works on the display panel is water, everything else is blank. Ice maker is making ice. Fridge is cold, but I need to lower temp but unable to on the display. You may have a faulty control panel board on your Frigidaire refrigerator. You can check the wiring to it to make sure it is secure. If only the WATER illuminates on the Frigidaire refrigerator display panel, it means the display board is getting power but may have other issues. Troubleshoot the issue further and you may find that you need a new display panel board. I have the Frigidaire Gallery model FGHB2866PF9A. When I push the “cube” button, it no longer shows an indicator light, but does dispense ice. If I press the button again, it shows a code ” IC – “. The water dispenser and crushed ice indicators and functions work normally. It is only the cube that will not indicate that it is in that mode. What is the possible fix? I have a Frigidaire Refrigerator #FGHC2331PF. When I put it on cube or crush it keeps beeping and displays error code d1 SP. But when I put it back on water, it stops. Have the SY EF error code on my Frigidaire refrigerator. Have expert look at and he replaced the board about a year ago. Checked the fan it is working. But when temp gets close to 0 it pops up again. Keep unplugging and plugging back in then works for awhile. Now it’s been working for almost a day but a afraid the message error will come back. Check wiring between evaporator fan and control board. Check for 12VDC to fan between red and brown wires. Check for variant voltage (depending on high or low speed) between yellow and brown. If correct replace evaporator fan. If error code still exist, replace control board. Personal experience on this one. I pulled out main board and saw a couple bulged capacitors the bronze like color. Bought 3 new capacitors less then $1.50, took board to tv REPAIR shop who soldered capacitors to board. Total cost parts @ labor $51.50. Have a side by side Frigidaire Model# FFHS2611LWKA . Woke to the freezer having frost all in it,settings is 3/5 was showing flashing H and a 1. It’s a little over a year old, what could it be ? Thanks . My digital display is not showing anything on the freezer and ice box side. I pulled the board and it seems there was a film over it and it was peeling underneath it was a lot of moisture and corrosion. If you have found moisture and corrosion on the Display board on your Frigidaire Refrigerator, that means the water line above it is loose and dripping water down onto the control board and the wiring. First, find the cause of the leak and fix it. After the leak is fixed, clean the area to remove all moisture and any rust or corrosion. Then, replace the board that the water dripped on and your Frigidaire refrigerator should be as good as new. You may need new wiring harnesses if the water damaged them also. Let us know what you find or if you need help fixing the leak or finding the correct part number. I have error code 4 flashing on a Frigidaire Refrigerator FFUS2613LS0, I changed the damper but the error 4 is still flashing. Please help! First, BE SURE THE DAMPER IS BEING SUPPLIED POWER. Check with a meter to make sure it is getting the correct voltage/power. Check the wiring harnesses from the board to the damper. Be sure they are not loose or damaged. Ensure that unit is well sealed to prevent excessive infiltration of moisture. Review unit leveling, door alignment and door gasket seal. Look for evidence of poor seal between the door and the cabinet. If unit is cooling, there will be excessive moisture present within the unit and around the perimeter of the gasket. If unit is not cooling, place a flashlight inside the unit to detect areas where the door gasket is not sealing well. If necessary, level the cabinet, align door, adjust or replace gasket to ensure good seal. Hi, I checked and wiring is good, but the damper motor is not getting correct voltage, only 5 volts. I guess the board is bad. I checked supply power in the damper motor and its only getting 5 volts. I guess I have a bad board. We have Frigidaire model FFSS2614QS4A with error code flashing 1 and H for freezer. It’s also not producing ice. I have a code on my Frigidaire “OF” “OF” and do not know what this code means. Please help. Thank you. The model number is DGUS2645LF6A, serial number is 4A52224462. Frigidaire Refrigerator Error Code OF OF = The freezer off setting has been turned ON. To turn the freezer off, set the control to 10° and push the up arrow. “OF” will appear in the display. With the control set to off, the freezer light will still operate, but neither the compressor or the defrost cycle will. There is a 13 minute compressor off time delay built into the control. To turn the control on push the down arrow. 10° will appear in the display. If the freezer is to be operated at a temperature below 10°, push the down arrow until the desired temperature is indicated on the control. The control is designed to fail safe. If the control fails the compressor runs continuously with a 30 minute defrost cycle every 12 hours. With a 5y EF code on my Frigidaire refrigerator, How do I know what to replace the evaporator fan or the control board? 5y EF code on Frigidaire refrigerator = The tech manual says to replace the evap fan or freezer fan first. The evap fan is the most likely issue when you have the error 5y EF. Sometimes it is just the wiring harness that is damaged or is not secure, so check the wiring harnesses from the evap fan to the control board. If replacing the evap fan does not clear the error code 5y EF, then the tech sheet says to replace the control board if a new evap fan did not clear the error. My model is FPHB2899LFB. It also shows 5Y EF or H1c H1c. I checked fan in the back, it is working/ running. Should I still replace fan or I only change the control board? Thanks. My Frigidaire Professional refrigerator has error code SB. I pressed the v for 5 seconds and then i pressed the other v button for 5 seconds and nothing happend. The buttons are not working. Your Frigidaire Professional refrigerator is in SABBATH MODE if SB or 5B appears on the display. The Sabbath Mode is a feature that disables portions of the refrigerator and its controls in accordance with observance of the weekly Sabbath and religious holidays within the Orthodox Jewish community. Sabbath Mode is turned ON and OFF by pressing and holding “∨” on freezer temp and “∧” on refrigerator temp for five seconds. The display shows “Sb” while in Sabbath mode. In the Sabbath Mode, the High Temp alarm is active for health reasons. If a high temperature alarm is activated during this time, for example due to a door left ajar, the alarm will sound intermittently for about 10 minutes. The alarm will then silence on its own and a red high temperature icon will display. The high temp icon will continue to display, even if the door is closed, until the Sabbath mode is exited and the icon reset. The refrigerator will function normally once the door is closed, without any violation of the Sabbath/Holidays. An error code cl displays when I press the “cube ice” button on my Frigidaire refrigerator. It does not dispense crushed ice. Check wiring between the User Interface and the Main Control Board. WHY would ANY refrigerator company put the control board UNDER the refrigerator?? We bought a brand new frigidaire refrigerator and then later a tree fell on the power line, leaving the refrigerator without electricity for around 14 hours. Condensation went downwards, impacting the control board. This would NOT have happened if the control board were on top of it or accessible through a panel on the back or the sides. How can it be that after so many years of making these products the refrigerators are not far more intelligently engineered? I emptied my ice drawer to fill an ice chest, as I have done many times this summer. Two days later, still no ice being made. Gallery French door. When I tap Ice cube icon, it lights up as it should. When I tap it again I get a display code of Ic -. Ice maker is turned on. Water dispenses. Refrigerator is 14 MONTHS old. Is the Frigidaire refrigerator code 1c, lc, or Lc-? If you have to tap on the ICE icon on the display, it would lead us to believe there is a wiring problem. Can you tell us the model number of your fridge? I have a model Frigidaire FGHC2331PF7. Just replaced defrost thermostat, now display shows correct temp on frig, but freezer temp constantly shows 33 and 34 degrees, back and forth. The freezer actual temp (with stand in refrigerator thermometer) is below zero. It’s been like this for over 24 hours now. If your Frigidaire FGHC2331PF7 fridge freezer is at the correct temp, but the display shows otherwise, check all wiring harnesses and electronic board connections. You may have a loose or faulty wiring harness or electronic board connection. It sounds like a simple communications error. Hopefully it is that and not a faulty board. Our frigidaire professional frig keeps blinking on and off 89 degree both frig and freezer. How do we set it and get the #s to stop blinking and stay at right temps? Side by side Frigidaire. Had been getting the flashing 4 error code. Had a repairman replace the damper. Still getting the flashing 4. Had the same repairman replace the main computer component. Still getting the flashing 4 error message. Unplug the fridge and it will keep temp for about 6 hours, then it stops again. The flashing 4 never goes away. Am I missing a reset procedure for everything to start working again. Is the problem with the fridge or the repairman? Hi! We have the codes SY EF, assuming it’s an evaporator fan issue. We cannot get the fridge fixed until Tuesday, and every 6 hours the alarm on the side door goes off because of the high temperature. Is there anyway to turn this alarm off? I tried pressing the Default Settings button, but eventually it goes back to the error message. Tired of hearing the beeping in the middle of the night! I have a HI temp error code on Frigidaire french door style refrigerator. I’ve tried defrosting, that worked for a few weeks, but now the same problem is reoccurring. Check that the defrost components are tight by inspecting the wire harnesses and other wiring. If so you can test the defrost components or replace them. If the problem is NOT related to defrost, try checking that the fan in the freezer is working as designed. That’s part of the problem, the refrigerator continuously runs because of the HI temp fault. Is there a thermostat or something that acts like one that could be failing? Have a Frigidaire FRIGIDAIRE 26 cu. ft. Side-by-Side. Just opened frig door and light out. Then noticed inside digital display for freezer flashing between 1 and H. Usually set at 5 for both freezer and fridge. What is this error? The Frigidaire refrigerator error H and 1 flashing “H1″… the refrigerator sees that the freezer/refrigerator temps are too warm. The temperatures are too warm. Unplug the fridge for 5 minutes. Plug it back in and you should be able to clear the error code. If not then there is an issue with cooing. Can you set the temp to be cooler or is the fridge not responding or cannot get to the desired temp? Thanks for responding. The reason I replaced the power board was because the frig was turning on and off 40 + times a day and everything indicated that the power board was failing. As soon as I put the new board in and I powered up the unit the display went to 2 and then EF. I opened up the freezer and checked the voltage at the evaporator fan and it read 0. I did cal the business that I bought the board from and they said the new board seemed to be faulty and they are sending me a new one. The frig would not cool with the new board. I hope the new board does the trick. The model # is EI26SS55GS0. I just replaced the power board and the EF code came after awhile. I turned it off and then unplugged it. I. Waited 5 min. And then turned it on. I set it to factory setting and waited. A few min. Later the number 2 came up on both the freezer and refrigerator display. It seems like nothing is happening. Any suggestions? If you just replaced the main power board because of the EF error code, and now the number 2 shows on both displays, we believe it means the fridge is still trying to get to the proper temperature. Do you have the temp settings correct? How long has it been since you replaced the board and have waited for the Frigidaire to cool? What is the model number of your Frigidaire refrigerator? I have a Frigidaire ffhb2740ps2 refrigerator and its displaying Sy Cf, whats wrong and how to fix please? Whatn to check = Check wiring between control board and user interface. Parts that may be faulty = Control board or user interface. I have a Frigidaire 2 side refrigerator and am getting codes 5Y EF. We tried unplugging it for 5 minutes and we got the correct temperatures back but now there is a large sounding noise from the fridge. Is there something I can try to do? The noise is most likely the fan. Change Evaporator fan or control board. What is the code 1C? My Frigidaire refrigerator part of my unit is not cooling. I pressed and held two of the buttons on the panel and “1C” popped up and the unit started cooling, but then after about two hours or so the temp is going back up. This is a brand new unit and the fridge part has not worked since day 1. The store told me that they thought it was in the demo mode and had me pressing and holding buttons. Finally two lit up and beeped, but then it never cooled. This is a Frigidaire Professional series model FPBS2777RFO. Error code 1C is not listed in the Frigidaire database. If your Frigidaire fridge has not worked properly from day 1, and it is NOT in demo or showcase mode, we would call the company who sold it to you and have them come out and either get it working properly or replace it completely. What 2 buttons did they have you press to attempt to get out of demo mode? I do not remember. they had me trying several combinations until it worked. This unit I have now is a replacement the store, Conns, offered me since they could not fix my prior fridge that was barely a year old. Could it have been “lc”? IC is not an error code. It is a setting of some kind. If you push “Cube” twice, it brings up this display and has 3 various settings, represented by small dashes on the right. I am trying to figure out what this setting is for. I am hoping it is the rate at which the ice maker makes ice, because mine was unable to keep up and we don’t use that much ice. Mine was on the first dash and I turned it up to 3 and am hoping for increased output. Have code E F on Frigidaire refrigerator. We have replaced the evaporator fan and the control board. We still have the E F code showing up. E F error means both components you replaced. My Frigidaire gallery stand up freezer single door. Frigidaire freezer display shows CE error = a communication error between the user interface and electronic module. First, check the wire connectors between the user interface and electronic module. Something may be disconnected, damaged, or loose. Check the wiring once again. When I run a service test on my frigidaire fridge I get at “Er” error code 58. Currently my ice maker is not working. Any idea what is happening or where the problem is? You ran the service test because your ice maker stopped working? You may need to inspect the ice maker to be sure all wire harnesses are connected and the switch is working properly. My fridge only says “ice er” and it’s not making ice can you tell me what is wrong with it please???? If your Frigidaire refrigerator displays the ICE ER, this is telling you there is an error within the ice maker system. We would suggest first unplugging the refrigerator for 5 minutes to see if that MAY clear the error. If not then troubleshooting will have to be done as the ICE ER code only tells you there is an issue within the ice maker system, may be an electrical connection issue, mechanical fault, etc. Is the fridge making ice? What is the model number of your refrigerator? What does error code PO mean? 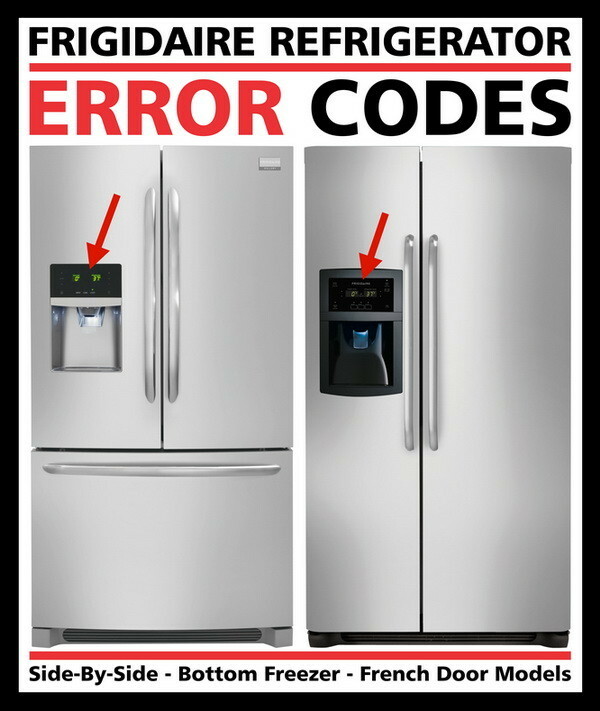 Is the error code on your Frigidaire refrigerator PO or OP error? Can you supply us with the model number? Can you give us the model number of your Frigidaire refrigerator getting the Cn error code? 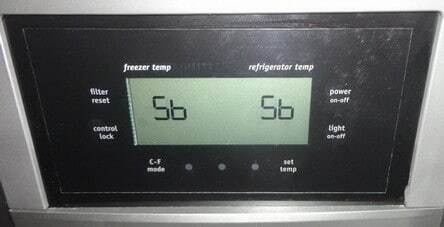 My Frigidaire says Sb Sb and there is no “V” and no “∧” on my fridge so what do i do? Your refrigerator is in SABBATH MODE. To clear it… Sabbath Mode is turned ON and OFF by pressing and holding “∨” on freezer temp and “∧” on refrigerator temp for 5 seconds. Try pressing FREEZER and REFRIGERATOR buttons. If this is not the display panel layout on your refrigerator, let us know the model number of your Frigidaire. Our Frigidaire Refrigerator says 5b error code on the display panel. There is no ^ or down sign to press. All lights are out inside and outside. How do I get to up and down scroll? The 5b code on the display of your Frigidaire refrigerator means SABBATH MODE. You need to press and HOLD the arrows to remove it, if the arrows are not lit up, press them anyway to try and get the fridge out of sabbath. Hold down both arrows for ten seconds to get OUT OF SABBATH MODE. If that does not work, unplug the fridge for 10 minutes, plug back in, and try once again. I have a Frigidaire FFSS2314QS9A Side-By-Side Unit. We just purchased it three days ago. The temperatures were both set to six. A couple of days later I noticed that both temperature indications are flashing between H1 and the refrigerator has not turned off at any time. The Use and Care Manual does not help too much on this issue.. The error code flashing H1 on your Frigidaire Refrigerator means the refrigerator believes that the freezer and refrigerator temperatures are warm. The temperatures are probably warm because your refrigerator is brand new. Try and unplug the refrigerator for 10 minutes. Plug it back in and you should be able to clear the error code. Also, try putting the temperatures for both freezer and refrigerator to as COLD as possible for 24 hours to be sure there is not a true fault in the fridge. If it still has an error, let us know and we can further assist. H1 is displayed on the screen of the refrigerator. What does it mean and how can I fix it? The Frigidaire refrigerator H1 error code means the refrigerator thinks the freezer and refrigerator temperatures are too warm. The temperatures are too warm because the unit needs the temp set correctly. Set thje temp to cold. If that does not work, unplug the refrigerator for 5 minutes and plug it back in. This should clear the error code. What does IC mean when pressing the cube ice on Frigidaire refrigerator? Is the ice maker and water dispenser working? When does the IC code appear? If your Frigidaire fridge lost power, let is sit for at least 24 hours to regain cooling. How long was the power out? My refrigerator is doing the same thing. Did you figure out the fix? When I press the Cube “button” between water and crush it displays 1c with an indicator of one bar that I can increase to 3 bars? It does dispense cubes. Is the error code on your Frigidaire refrigerator 1c or is it t3. Please let us know the correct error code and give us the model number of your fridge. Actually the culprit was a big block of ice caused by too much water pressure heading into the ice maker (and the splash ice building up over the years). Whatever it did freaked out the board and tripped the error code. A fix of the water tube and turning the water pressure down did the trick. Thanks for the obvious solution to the problem. I have a Frigidaire Model # FFSC2323LE9 side by side counter depth refrigerator/freezer that is approximately 2 years old. Yesterday I received the error code SY EF and lost both sides of the unit as they both were not working while this error code was present. We took all of the food out and put them in other freezers/refrigerators, however, by the time we did that (approximately 1 hour) the temperature in the refrigerator part read 58 degrees. I pulled out the refrigerator upon your suggestion to recycle the board with a “power cycle” ,so to speak, and the refrigerator’s error codes disappeared upon power up and now both sides appear to be functioning perfectly 24 hours later. My question is: Will this continue or should I have a tech come out anyway to ensure it is not something more serious? I would hate to move everything back into my refrigerator/freezer only to have the same error code pop up next week. Is what I did a permanent fix in your opinion or is it simply a temporary fix of a problem that will be reoccurring? Any help and advice would be appreciated greatly!!! SY EF means Evaporator fan circuit failure. To not have this issue again, replace the evap fan or wiring to it. Our new Frigidaire refrigerator is showing F in the refrigerator control inside. Brand new plugged in for over 12 hours and not cooling at all. This F or E error code on your Frigidaire refrigerator relates to the evaporator fan motor. It may also be a control board problem. Reset the control board by unplugging the refrigerator for 5 minutes and plugging back in. That may reset the fridge and the error will clear. My fridge is blinking 4 on the fridge side. It says that error code is the air damper. The freezer isn’t blinking at all. We developed a leak inside the freezer and we thought it was the ice maker so we stopped using it but it is still leaking. I’m assuming it is the water hose or something to do with the water. It started flashing the 4 yesterday and this morning when I get up the items in the freezer were thawing out. Would the air damper have something to do with that as well? Frigidaire Refrigerator Flashing #4 happens when power is applied to the fridge and the control board goes through it’s cycles and didn’t detect a damper connection. The damper controls the air flow from the freezer into the refrigerator. Test to be sure the damper is faulty and if so, replace the damper. My refrigerator error message I am receiving is 5B or SB, which the known messages indicate to fix by turning on / off the Sabbath Mode with the up / down arrow keys. But there is no arrow keys. any suggestions. Sabbath Mode is turned ON and OFF by pressing and holding “Control Lock” and “Power on/off” buttons for five seconds. It was very difficult to find this so simple explanation but for these new refrigerators. When you browse the internet you’ll always find that you should “press both arrows at the same time” (which is not my case). Of course, it solved my problem and saved me money (I should have requested a technician to solve it and, probably, “some parts” (i.e. main board) would have been “needed to be replaced!”). Thank you very much for disclosing this type of information. Update: The cooling for the Refrigerator and freezer are Not working. I have a side by side Frigidaire refrigerator with model # LGHB2867PF0. It is giving me a error code of SY CF on the interface board. The interface board seems to be operating normal It will allow me to scroll through the menu and make various selections. I scrolled through the menu and restored the factory defaults. This temporarily cleared the error code but after several seconds the error code returned. I attempted to reset the refrigerator by unplugging and re-plugging the unit back in. It briefly read normal before the SY CF error code returned. The Refrigerator appears to be cooling for now. I read on another site that this was possibly the control board. Two questions : Will the unit continue to cool while I order and receive parts? Do you agree with the diagnosis of control board? If your Frigidaire is continuing to cool despite the SY CF error code, you should be okay ordering parts and the unit should continue to cool. I have a Frigidaire refrigerator with freezer and fresh food temperature controls. The controls would not program. Replaced the control board and wiring harness. Everything now works except the freezer control, after setting, flashes 3 constantly. Model # plhs69eessn. Part replaced # 5303918340. I suspect a bad freezer thermistor or wiring, any suggestions would be appreciated. Frigidaire Refrigerator Flashing 3 = Thermistor is shorted. A new thermistor should fix your Frigidaire refrigerator. I have a Hitachi refrigerator that I see a error in refrigerator display. This error is FO 12 and the compressor don’t stop at all. The temperature in cabinet is normal. Can you help me please? Hitachi Refrigerator getting the F0 12 Error code: Warm air is leaking up thru the ice dispenser funnel. Unplug fridge. Clear the frozen lumps of ice that may be blocking the ice maker. Plug fridge back in. The freezer and cooler temps should now display and the ice maker should be making ice again. Let us know if this worked for you. Did it clear the Fo12 error code? I have Frigidaire Gallery…. Error code is “SE EF”. I shut off the ice maker just in-case. Question is: Can fridge stay cold until I get a tech out to my house? This means your Frigidaire has the temp too high meaning not cool enough to keep your food fresh and or frozen. 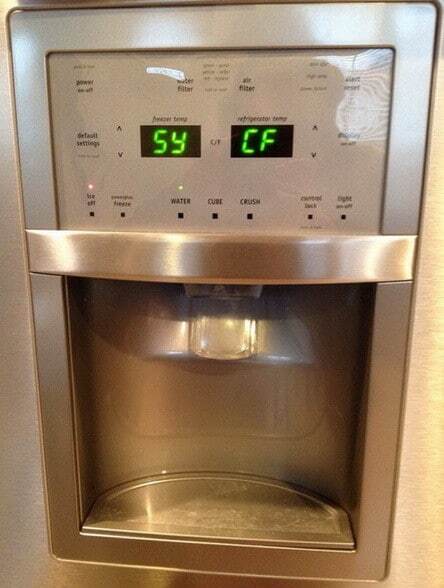 Try changing the fridge temp controls to get the temperature lower. Just had a fridge delivered. Let it sit on factory settings for 24 hours. It’s flashing H 1 on the control panel. Can’t find this code in the book. It started at 6 on both fridge and freazer which I’d the factory setting. Thanks. The Frigidaire refrigerator error code H1 means the refrigerator thinks the freezer and refrigerator temperatures are warm. The temp is warm as the fridge is new and came room temperature. Unplug the refrigerator for 5 minutes, plug it back in, and the error code should clear. What is the model of the frigidaire refrigerator control panel you have pictured here? We have this model, but can’t find the model number. There are more than one pictured… can you tell us which one you are referring to? If you cannot find the model number of your refrigerator, look inside the fridge section on the walls, door and even in the freezer. There should be a tag that tells you the model number and serial of the refrigerator. I have a Frigidaire FGHB2844LFE and the ice machine was acting up before it eventually just shut off and there was no power. I have replaced the main control board and got some power back but got code SY CE so i then changed the user interface board. When I power it up i get the same code. Any other suggestions or do I need to call someone out to fix it. If you have replaced the main control board and you still get the SY CE code, you may have a loose wire harness or wire connector somewhere. Further troubleshooting is required. Hello, I have a Frigidaire refrigerator FFS2622MS that I bought almost 2 years ago. We keep getting this beeping sound and getting a H for Freezer and H for Refrigerator? The H error on the display usually means TEMP TOO HIGH. Can you count how many times it beeps? It will beep a certain amount of times, then pause, then it will beep again… this will tell us what could be the issue. Have you tried unplugging the fridge for 5 minutes and back in to see if that MAY reset the board? Make sure the temp is not set HIGH, set to low extra cool and see if the H on the display goes away. Let us know what you find. I have a Frigidaire professional fridge, it’s very new but no warranty on it. It say High Temp on the display screen. Do you know what that could be? It means the temp is to high in the fridge or freezer, try using the temp controls and LOWERING the temp. Frigidaire Refrigerator = I have power to my display with no apparent power to any other component. No clicking on start up, no buzzing…. just silence. My display thermostats display freezer temp 0 and fridge temp 34 when I plug it in. They very shortly after that turn to 32deg for both of them. They have been there for about 24 hr now. When I press and hold the crush or cube button I get a d1 on freezer temp and a SP on fridge temp. Frigidaire Refrigerator d1 SP is an error saying the ice maker is jammed (DISP). Check for ice blockage, clear blockage, and then unplug fridge for 5 minutes and see if that resets the display. Let us know if this works. My Frigidaire is showing the code 5Y EF…is that something I can fix on my own? Or do I have to out source? My Frigidaire professional refrigerator is not working. The error code is SY and EF. Can you help me? Check the wiring between the evap fan and control board. Check for 12 VDC to fan between red and brown wires. If wires check out replace the evap fan. If the error code comes back then replace the control board. FGHB2844LF4 FRIGIDAIRE Bottom-Mount Refrigerator with a OP code on freezer side of the display. Did you recently have a power outage? This error code most likely shows after a power outage and simply needs to be reset. See this page here for How To Reset A Refrigerator Display Panel. Frigidaire FGUS2642LF0 with refrigerator display code “OP”. The refrigerator side not as cool as usual, everything good on the freezer side and the fan on top of the evaporator is working properly. I changed the thermistor (part number 240597203) which is located on the back inside wall of the refrigerator side between first and second shelf from the top. I also checked evaporator on the freezer side and discovered it was not frozen, but had minimum frost ice build up which I cleared. There is an round opening on the left inside wall on the refrigerator side (if I am looking at the fridge with the door open) that blows cold air to the refrigerator near/above the vegetable drawers. There is also cold air blowing form the freezer to the fridge from the top left wall of the refrigerator (although I believe it is blowing less cold air than normal. The digital display reads “0” for the freezer and “OP” or sometimes -39*F, but mostly stays on “OP”. The fridge has been like this for a few days now; thermistor was changed yesterday with no avail. Please let me know if you need additional information. Thanks in advance for any input! Frigidaire Refrigerator OP error code = Freezer sensor open in freezer display = Check wiring between thermistor and board. I went to the main power board and disconnected and reconnected all of the plugs connected to it. The digital display immediately showed the correct refrigerator temperature and I noticed the cooling is back to normal. It has been working flawlessly since. Thanks for your fast response and God Bless! I am having the same issue with mine. Could you please describe to be where the main power board is located? I had a flashing 4 code on my Frigidaire refrigerator. The freezer then didn’t work. I unplugged the power and then plugged back and now all is working and no flashing code. Does the damper still have to be replaced? If the fridge is working, then right now you do not need to replace the damper. If the problem comes back then consider replacing it. Frigidaire model FGHN2844LF4 and last night it went into error code 5y ef so i unplugged it and waited 24 hrs before plugging. When plugged it back in the Condenser Fan is turning and the compressor engages but the copper lines off the compressor are not getting cold. They started to and then stopped. Also the reading for both the Refrigerator part says HI and also for the Freezer says HI. It seems to me that my compressor may be going out or the mother board not sending the correct signals. Any suggestion on how to verify what the true issue is. I was prepared to replace the Fan but i don’t believe its a fan issue because it turns on first then the compressor. Check the wiring between the evaporator fan and the control board. Check for 12 VDC to the fan between the red and brown wires. Check for variant voltage between yellow and brown wires. If VDC is correct then replace evaporator fan. If the error code still comes back then replace the control board. I am also getting the 5Y EF code on my Fridgidaire Professional bottom freezer, side by side. I replaced the fan since it was not turning when I took the cover off, but I still get the code. The fridge and freezer are cold though. What could it be? If you replaced the fan after getting the 5Y EF error code on your Frigidaire refrigerator, the official repair guide says to replace the control board. If your refrigerator is running fine despite the error code, try unplugging the wire harness that goes to the display panel to see if that may reset the display board. Unplug the fridge before you do this. If you continue to have the issue, you can replace the control board as a last resort. The official repair guide says this: Check the wiring between the evaporator fan and control board. Check for 12 VDC to fan between the red and brown wires. Check for variant voltage (depending on high or low speed) between yellow and brown. If correct then replace the evaporator fan. If error code still exist, replace control board. Sy ef code. How would I know if it’s just the fan or control board that isn’t working without the proper tools? Could I start with replacing the fan? Bought a new control board for my Frigidaire refrigerator, clicked into place and then plugged in. It has the same code, SY CF. Check the wiring between the evaporator fan and the control board. Check for 12 VDC to the fan between the red and brown wires. Check for variant voltage between yellow and brown wires. If VDC is correct then replace evaporator fan. Does the display on your Frigidaire fridge say OFF or OF? My frigidaire gallery side by side with ice maker model GLHS66EEQ7 is showing 0 for freezer and F for fridge where the adjustments are numbers are located. Can not get them to move up or down . Any ideas what has happened or how to fix it? Is your Frigidaire refrigerator and freezer working properly or is the freezer OFF but the fridge section is ON? To turn the control on push the down arrow. 10° will appear in the display. If the freezer is to be operated at a temperature below 10°, push the down arrow until the desired temperature is indicated on the control. Here is what we found for the OF error code…. What is the IC error code on Frigidaire fridge? Is the IC error code on your Frigidaire on the freezer side of the display? This would mean you have an issue with the ice maker. Can you try resetting it by either turning off the ice maker, or unplugging the fridge for 10 minutes. Can you give us the model number of your fridge? Sometimes my new Frigidaire gallery refrigerator displays ERROR CODE IC and no cubes come out. I’ve had the unit about one month. I slide my finger and touch crushed then water then cubed and sometimes it works and cubed ice cubes out and IC code goes away. Can you help? IC error means ICE MAKER ERROR on Frigidaire. Turn the ice maker OFF and back ON. If that does not reset, then unplug fridge for 10 minutes. If that does not work… Remove the ice maker, check for problems, and reinstall. Many times it is just an error or loose connection that needs to be reset. Frigidaire side by side error code 0F. What is it? Can you please check again as our database show error code 0F for Samsung refrigerators. Is the code df? What are the symptoms of the refrigerator? Please recheck and get back to us. Frigidaire French door refrigerator with ice maker on top. It will not dispense cubed ice. Getting error code IC and can’t find what that means. It will dispense crushed ice. Are you sure the error is IC? The only Frigidaire refrigerator error code we find in our database for IC is a power outage but that does not sound correct for your specific issue. Have you tried unplugging the refrigerator to reset? Have you made sure the wire harness is connected properly to the ice maker? If the ice maker makes crushed ice but not cubed ice, it may be possible there is an issue with the ice maker itself. Have you removed the ice maker and inspected it for damage and to be sure it is installed correctly? There could also be a board issue which is causing the dispenser to not operate properly. What exactly happens if you try to dispense cubed ice? Does the dispenser make a sound, clicking? Does the motor run? Is the IC error code always displayed or only when you try and dispense cubed ice? Yes it is IC. Yes have removed the ice maker and all looks well. When trying to dispense cubed ice – press the cubed button and code IC appears, no sound or noise of any kind. Press crushed ice button and crushed ice is dispensed no issue. The refrigerator is a French Door model with the ice maker on top, freezer on the bottom. Have not unplugged the refrigerator. Try unplugging the fridge for 5 or 10 minutes and see if that clears the error. It most likely will not clear the error code if the ice maker has a bad component. If the ice maker does not make a sound when you try and dispense ice, you may have an issue with the microswitch or motor, actuator. Have you tested the components in the ice maker and dispenser to be sure they are in working order? A part needs to be replaced before the error code will clear. I have a Kenmore French door bottom freezer. The SY CF is displaying in the front. Lights are out and it’s starting to warm up. I’m not sure if it has anything to do with a sensor I saw in the ice bin. Need to figure out how to fix it. SY CF Error Code is a communication failure when the fridge is powered up = Check the wiring that goes from the interface to the control board. Check to be sure connections are not loose or damaged. How do you take the panel off to replace the thermometer? Are you talking about the thermostat or? Are you trying to remove the front panel on the dispenser? Or are you trying to remove the panel on the inside of the fridge? Please explain in detail and let us know your model number of your Frigidaire refrigerator. Please tell me how to remove the panel on the freezer door so I can change the control board? Do I remove door panel? Or pinch the plastic trim around the display board for access? Can you please give us the exact model number of your Frigidaire refrigerator? We will be happy to assist once we have the info. Can you please describe your Frigidaire refrigerator issue in deep detail so we may assist? My Frigidaire Refrigerator is showing an H for the freezer and F for the Refrigerator. The refrigerator side is not holding a cold temperature. I’ve tried several times resetting the temperature to a higher 9 level and it does not work. It stays at 1? What do these codes means? Is it something I can fix on my own? It sounds as if the fridge MAY be in diagnostic mode or display mode. What is the model number of your refrigerator so we can instruct you as to how to reset? I have a Kenmore fridge. I just replaced the main board for a defrost problem, but now its flashing EF for evaporator fan, except that the evaporator fan is running, could the thermistor in the refrigerator section be causing this error? The thermistor checks the fridge temp and relays the temperature to the main computer control board. This board will regulate the power to the compressor & evap fan. If the thermistor is bad, then all this does not happen and the fridge will not cool. The compressor will not run or may run too often. Test the thermistor with a multimeter. If the thermistor has no continuity then it needs to be replaced. Are you sure it is not error code OP or dF? OF is not in the Frigidaire database. 0 degrees Farenheit? Isnt that just your freezer temp? Frigidaire refrigerator – I have OF on my freezer (O) and refrigerator (F) number panel when I press the “OFF” button. May stand for “OFF”? I have a flashing 4 on my fridge side display with temp not as cold as needed. That is why I’m here. Is the error code OF actually dF by chance? Can you reset the display panel by holding 2 of the buttons for 8 seconds? Try that and see if it resets. The Flashing 4 happens when power is applied to the refrigerator and the control board goes through the cycles but did not detect a damper connection. Possibly the air damper is faulty. Here is a video for Frigidaire Refrigerator Air Damper Control Replacement. Let us know if the error code is correct and what the model number of your refrigerator is. I have the Error Code ‘OF” on my Frigidaire side by side JSI-26. What is this error and how do I fix it? I got the error code to go away. I unplugged the fridge and waited a few seconds, then plugged it back in. Everything is working fine now. As a side note to the evaporator fan, when you open the freezer door, the fan shuts off so you have to push the little button that turns off the lights and lets the fan come back on. Also, I still believe the old fan was bad, I tried putting 12vdc to the wires and it did not spin. So unless there needs to be another signal from the control board to the other 2 wires to tell the fan to turn on, this is a bad fan. Previous post: LG Refrigerator Error Codes – Error Code Definitions – How To Fix?